*Note: This review was first published during coverage of the 2014 Sundance Film Festival. I like Miles Teller. I liked him in The Spectacular Now, I liked him in the Footloose remake and I liked him in the better-than-it-had-any-right-to-be 21 And Over. But his performance in Whiplash is what I like most. In Whiplash, Teller eschews his typical Gen-Y Vince Vaughn cool guy to play a drummer named Andrew so singularly-driven by his desire to be the best that he is misanthropic, abrasive and willing to undergo what can only be described as emotional (and sometimes physical) torture at the hands of his director, a terrifyingly volatile and terrific J.K. Simmons. Insulted and occasionally assaulted, Andrew only hunkers down further to practice until his hands literally bleed. It’s hard to explain exactly how he does it, but (the shockingly young) director Damien Chazelle portrays a series of jazz music performances with the same pulse-pounding tension of a Paul Greengrass car chase. In J.K. Simmons he creates a true villain, sneering and dangerous, and the cat and mouse between teacher and student escalates to a fever pitch typically reserved for thrillers where lives are at stake. The movie is not seamless. Outside of the central duo the supporting characters serve mainly as placeholders. Paul Reiser, as Andrew’s father, is never quite established as supportive or discouraging and a throwaway plot with a romantic interest is introduced in what could only be a design to illustrate just how myopic Andrew’s interests are. In other words, she’s little more than a prop that demonstrates just how committed the musician is to his art. But those critiques are minor, as Chazelle has crafted a film that is ambitious in its simplicity and utilizes sound to an at-times uncomfortably visceral level. Whiplash will leave you exhausted in the way that a runner feels after a sprint, pulsing with adrenaline and perspiring. 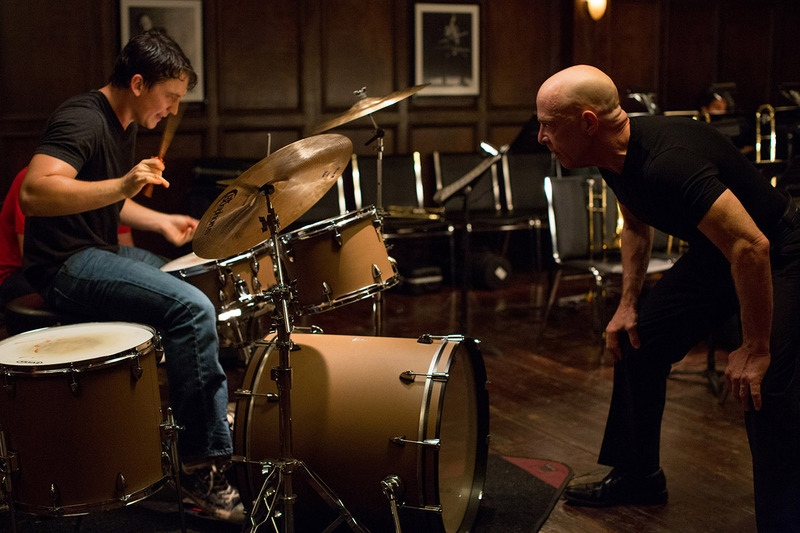 *Whiplash opens in Salt Lake City on Friday, Nov. 7. In Whiplash, Teller eschews his typical Gen-Y Vince Vaughn cool guy to play a drummer named Andrew so singularly-driven by his desire to be the best that he is misanthropic, abrasive and willing to undergo what can only be described as emotional torture at the hands of his director, a terrifyingly volatile and terrific J.K. Simmons. Insulted and occasionally assaulted, Andrew only hunkers down further to practice until his hands literally bleed. It’s hard to explain exactly how he does it, but (the shockingly young) director Damien Chazelle portrays a series of jazz music performances with the same pulse-pounding tension of a Paul Greengrass film. In J.K. Simmons he creates a true villain, sneering and dangerous, and the cat and mouse between teacher and student escalates to a fever pitch typically reserved for thrillers where lives are at stake. The movie is not seamless. Outside of the central duo the supporting characters serve mainly as placeholders. Paul Reiser as the father figure is never quite established as supportive or discouraging and a throwaway plot with a romantic interest is introduced in what could only be a design to illustrate just how myopic Andrew’s interests are.